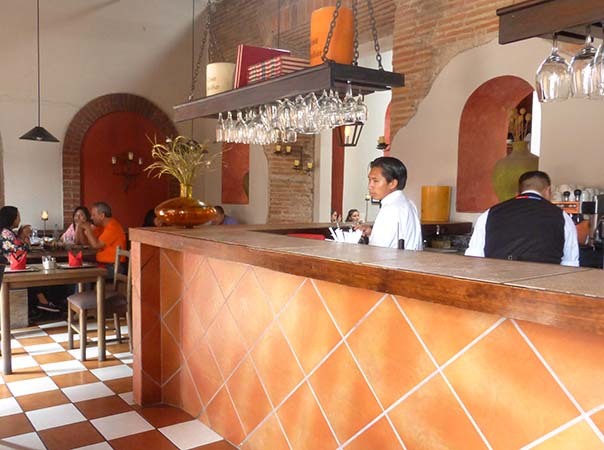 Antigua is an hour and a half from Panajachel and about an hour from the capitol of the country, Guatemala City. 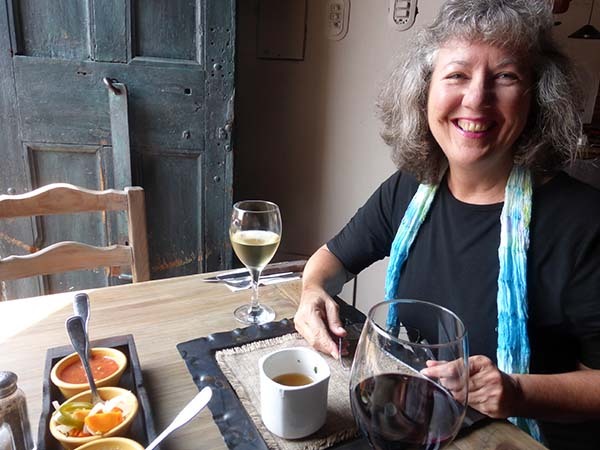 We find ourselves "vacationing" for a few days in Antigua when we want a change of pace from Lake Atitlan, or sometimes we'll stay overnight on our way to the Guatemala City International Airport. 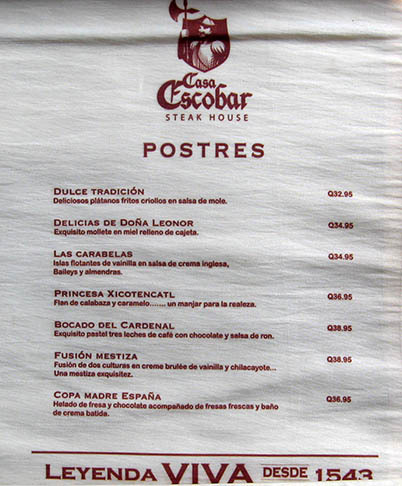 On previous visits, we noticed this steak house, Casa Escobar and had read very good reviews of their service and meals. It was time to try it out for ourselves. The outside of the building is unassuming. Just a small sign on antique walls with peeling paint that artists learn to recreate to bring a certain classic atmosphere to expensive homes. 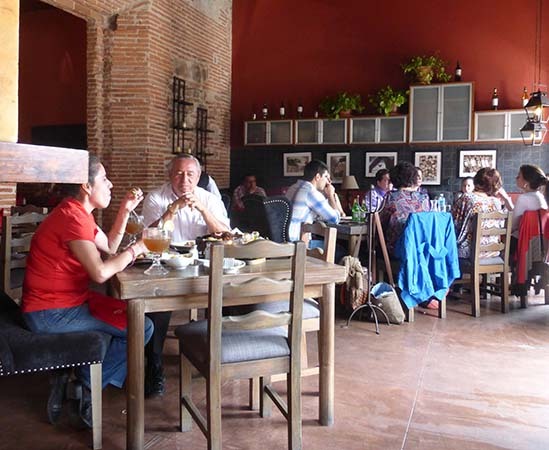 The inside is semi-formal yet comfortable, and the day we were there, a continuous flow of hungry patrons flocked to the restaurant. Families as well as lovers wanting a special meal for a notable occasion were seated around the room. Notice the beautiful brick walls and the deep red painted one. This color of red is often referred to as "Maya Red." Beverages range from wine, beer, specialty coffees, fruit juices and punch to designer drinks without alcohol such as a Virgin Pina Colada. 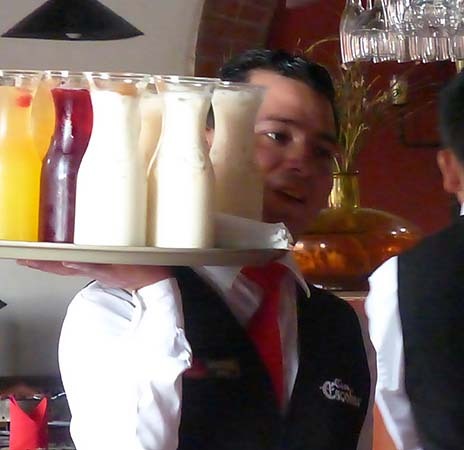 Here you see half liters of fruit punch, cold Jamaica tea (pronounced ha-MY-kah) and horchata, a sweet drink made from rice. We ordered steaks since this place is famous for exactly this and promises them to be "legendary." A tray of salsas and marinated jalapeno vegetables are set on our table and our first course is a taza of consommé. Notice the old door in the background. One really has to wonder how old some of these doors really are. Many in Antigua seem straight from the days of the Conquistadores. Our top sirloin arrived and was out of this world. 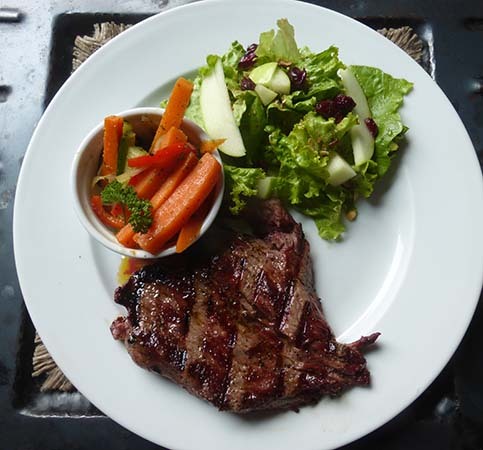 It was accompanied by sautéed fresh vegetables and a green salad with apples and raisins in a delicate vinaigrette. As Bob Hope would sing, "Thanks... for the memories!" and we love to collect them. 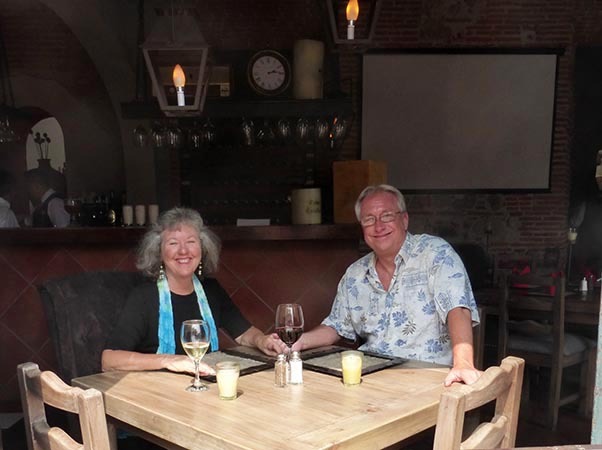 Behind us you can see the beautifully tiled bar and the brick walls of Casa Escobar. 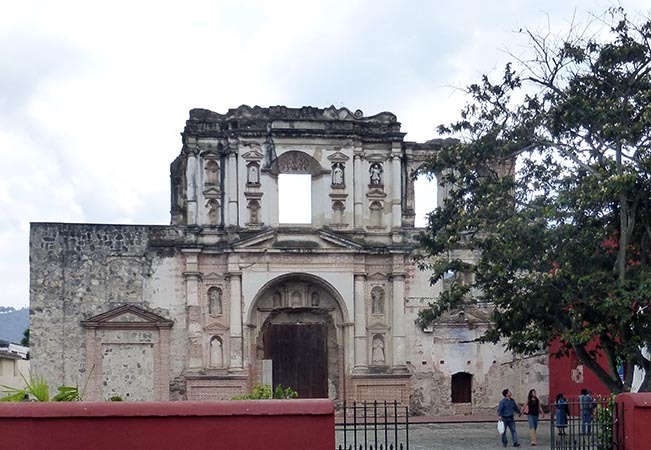 There are ruins all over the city of Antigua and this beautiful building is called Compania de Jesus Church, a Jesuit complex, started in 1676. There were continuous earthquakes all during the 16th to the 18th centuries in Antigua, finally forcing the capitol to move to its present day location in Guatemala City. Supposedly, this building is slated for renovation, but I don't think it will be any time soon. A fine meal deserves a follow up dessert and our choices were scrumptious: Floating Islands of meringue with crème anglais, Baileys and almonds, Pumpkin Flan with caramel sauce, Tres Leches cake with chocolate and rum sauces, Crème Brulee and Ice Cream with chocolate and fresh strawberries. Could we eat three of them? 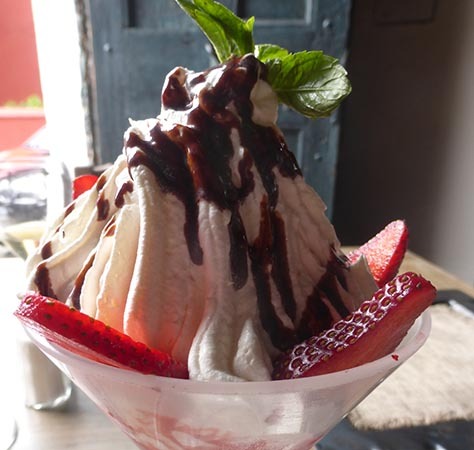 We decided on the ice cream with fresh strawberries, whipped cream and chocolate. I know, I know... decadent. But you would be proud of us to know that we didn't order three different ones to begin with and skip our meal! 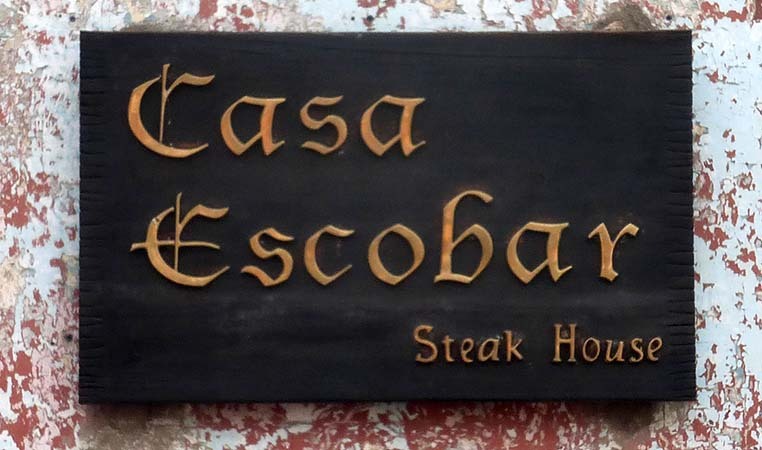 If you are ever in Antigua, Guatemala, be sure to stop by Casa Escobar and enjoy a meal. Take a look at their website below and click on their menu. I'll bet you'll book a flight to Guatemala the same night!